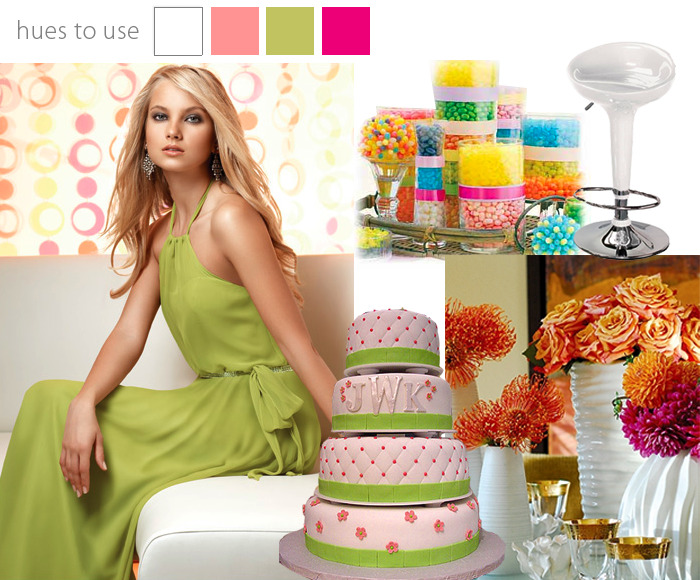 This mod look and cheerful palette lends to a reception full of fun! This lime green Jim Hjelm gown is hip, cool and distinctively different. The Jim Hjelm line is carried at Bridal Classiques in Tulsa, Oklahoma. We recommend adding playful elements to the reception décor like this candy bar with a collection of colorful jelly beans and seating like these white, high gloss gelato chairs with tall ice cream tables from Marianne’s Rentals. For centerpieces, consider coupling chunky white, high gloss vases in various sizes with bright, colorful florals. Cute and classy, we love this quilted polka-dot cake with monogram – a creation of Oklahoma cake artist, Sugar, in Norman, Oklahoma. With the right vibrant lighting from Innovative Entertainment Solutions, this look is sure to bring your wedding reception to life! Enjoy!